Instant Pot Chicken Marsala is a restaurant quality dish, full of flavors, with incredibly tender chicken. It is easily made in the Instant Pot for the perfect weeknight meal. Instant Pot recipes are favorite around here, because they are made in a fraction of the time, and are perfect during weeknights. Like our popular Instant Pot Orange Chicken, Instant Pot General Tso, and Instant Pot Mongolian Chicken, this Chicken Marsala is full of delicious flavors. Instant Pot Chicken Marsala is creamy, flavorful, and comes together in about 30 minutes. For this recipe, we used chicken thighs because they give a richer and a more profound flavor. However, chicken breast works perfectly fine as well. Traditionally, the meat is coated in flour and briefly sautéed, but since I wanted a lighter version, I skipped that step. I also don’t find it necessary, since the chicken will later be broiled to add crispiness. Our favorite part about this recipe is the marsala wine sauce which gives this dish a rich and savory taste. 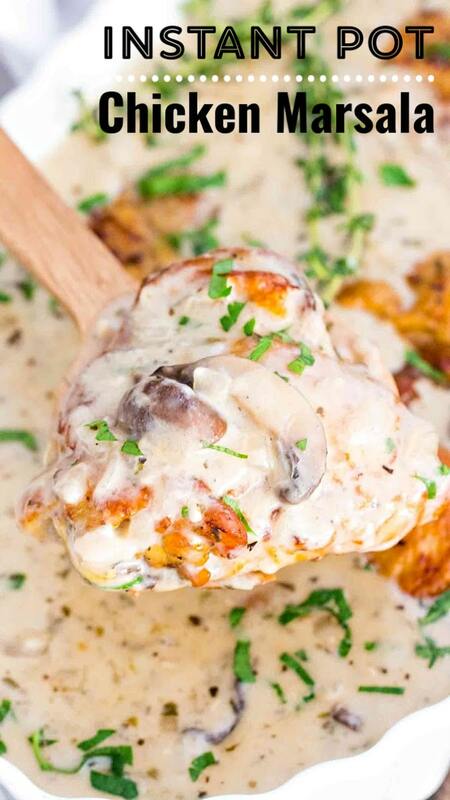 The combination of mushrooms and heavy cream goes well in this dish. The delicious buttery and tender chicken, full of aromatic spices is still a favorite here. We love making it at home and serving it with pasta and bread for dipping. It is such an indulgence! First, add 4-5 tablespoons of olive oil to the Instant Pot while on SAUTE mode. Add chicken thighs to the Instant Pot and sauté till golden brown on each side (3-4 minutes). Remove the chicken to a plate and use 1/2 cup of chicken broth to deglaze the pot. After that, add and sauté the mushrooms, onions, garlic, and dried herbs. Next, add the 1/2 cup of chicken broth, 2/3 cup Marsala wine, and chicken thighs back to the Instant Pot. Season with salt and pepper to taste. Cook on High-Pressure mode for 10 minutes with a 15-minute natural release. When the chicken is finished cooking, remove it to a baking sheet and broil it until crispy. With the Instant Pot on SAUTE, add the heavy cream and cornstarch slurry. The sauce will be creamy and it will thicken from the cornstarch. Just before serving, you can sprinkle the dish with chopped parsley. Use quality meat, it will make a huge difference in taste. Also, the best way to brown the chicken tights in the Instant Pot is to do it in small batches and not turning until they have formed a crust on the bottom. This way, you will have a perfect golden brown chicken, and also they will not stick to the Instant Pot. Another option is to brown the chicken in a skillet, while you sauté the mushrooms in the Instant Pot. In addition, I prefer to dry the mushrooms when making my Chicken Marsala. I let the mushrooms soak in hot water for at least a couple hours before cooking. As a result, the mushrooms soak up the liquid and become soft and tender. Instant Pot – I have the 6 quarts one and use it all the time. It makes weeknight meals so much easier. We used chicken thighs in this recipe for a richer flavor. However, you can use chicken breast or even chicken drumsticks. Both will work well, and the cook time should be the same. What wine is best to use for chicken marsala? Dry Marsala wine works best in this dish. Marsala wine has a deep, smokey flavor, which is perfect for really savory dishes like this one. WHAT IS BEST TO SERVE WITH INSTANT POT CHICKEN MARSALA? Chicken Marsala can be easily frozen. To do so, you will have to let the chicken mixture cool to room temperature. Then, seal in separate large zip-top plastic freezer bags. Label with the date, and freeze for up to 2-3 months, or longer if you use a deep freezer. Transfer the frozen Chicken Marsala to your refrigerator the night before you wish to use it to allow it to thaw. Reheat it to at least 350 F for about 20 minutes before you consume it. This step can be done in the Instant Pot or in a skillet on the stove. You can also skip it, and just broil the chicken at the end. Turn on Instant Pot and select SAUTE mode, adjust to HOT. Once the Instant Pot reads HOT, add the oil to the pot and let it warm up for a minute. Add the chicken thighs to the hot oil, and brown on each side for a few minutes. Once the chicken is golden brown on each side, remove it from the pot and set it aside on a plate. Cover with foil to keep it warm. Add 1/2 cup of chicken broth to the hot pot and deglaze it, using a wooden spoon to scrape the sides and bottom on the pot. With the Instant Pot still on SAUTE mode, add diced onion, stir and cook for 1 minute. Add the sliced mushrooms and garlic, stir and cook for about 5 minutes, until the mushrooms are just tender. Add the dried herbs: basil, oregano, parsley, also salt and pepper to taste. Add the remaining 1/2 cup of chicken broth and 2/3 cup of Marsala wine. Stir to combine. Add the chicken back to the pot on top of the mushrooms, skin side up. If preferred, add a bunch of fresh thyme. Close and secure the lid. Point knob to sealed and PRESSURE COOK on HIGH for 10 minutes, followed by a 15 minutes Natural Pressure Release. Open the Instant Pot, discard thyme and gently transfer chicken thighs to a baking sheet lined with parchment paper. Lightly spray the chicken with cooking spray or brush with olive oil and broil for about 5 minutes, until crispy. Watch it carefully to not burn it. In the meantime, turn on SAUTE mode and add cream to the pot. Stir to combine and bring to a light simmer. In a small bowl whisk together cornstarch and water until cornstarch is fully dissolved and add the mixture to the Instant Pot. Stir to combine and cook for a few minutes to thicken the sauce. If needed add more cornstarch and water mixture. 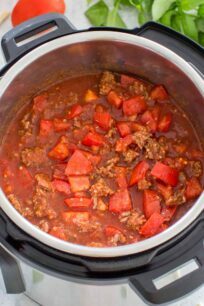 Keep in mind that the sauce will thicken more once it cools. 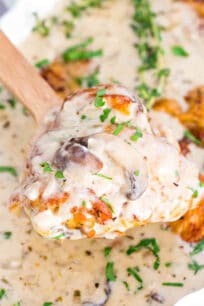 Transfer the creamy sauce to a large serving dish and place the chicken on top. Garnish with fresh parsley. I am so interested in getting this pot. 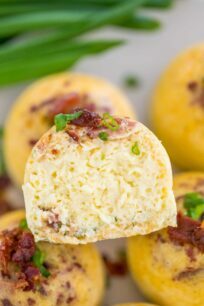 This recipe sounds so good and really easy to make. I hope I get one for Christmas! You should get one, you will love it! 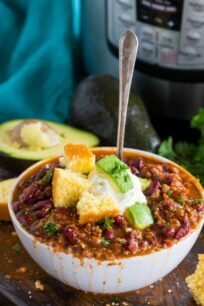 This looks so quick and easy using the instant pot! Perfect weeknight dinner! Your photos have me craving this now! It’s one of my favorites and can’t wait to try it in an IP. I agree with chicken marsala is restaurant favorite one. Instant pot makes cooking everything easy. I too use instant pot everyday. 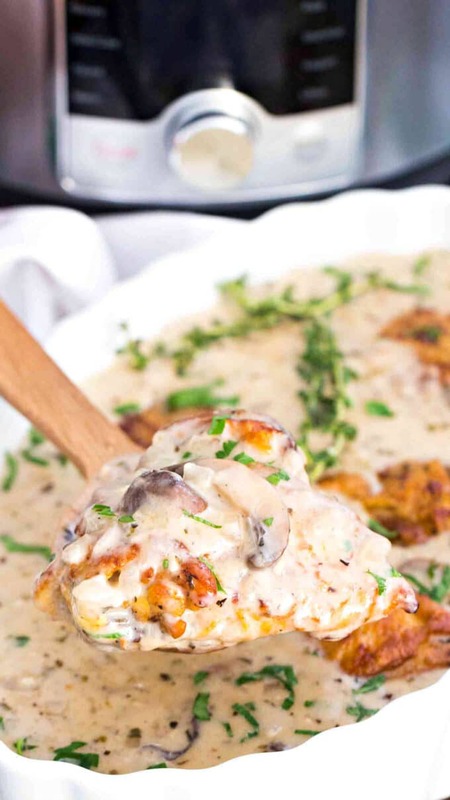 Love this creamy rich Chicken marsala with less effort. So much easier and quicker! This is absolutely a fabulous weeknight dinner! I bet those flavors on it are amazing, can’t wait to give it a try! OMG, this was amazing. My family including my picky kids loved it. I bought a bag of frozen breast tenders and doubled the liquid part of the recipe along with the shallots and garlic. We had it over bow tie pasta. My husband wants again tomorrow night. Thank you, this is our favorite. Instant Pot dishes are always a great idea! This is in our future! So easy and delicious! I love my instant pot, and I love finding tried and true recipe my family will love. I am going to give this a try! What a comforting and delicious meal for the winter evenings. Your photos are absolutely drool worthy! I would love this tonight for dinner. 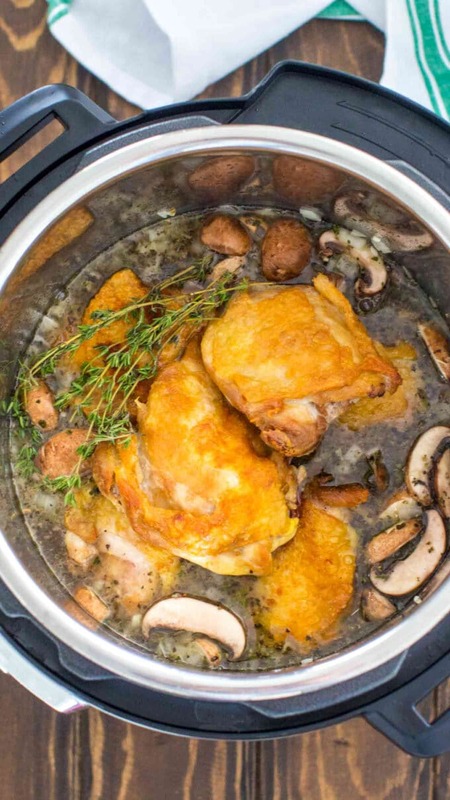 You have some amazing Instant Pot recipes and this Chicken Marsala is no exception. We also prefer using chicken thighs — they don’t dry out and they are so easy to use for delicious recipes. I’m hoping that I get an Instant Pot for Christmas — then I can try out all of your recipes. I’m so stoked to try this! Perfect to add to our menu while I’m on maternity leave! I love this! looks so good! This couldn’t look any more perfect! Hi Katie, thank you for the nice feedback, glad you have enjoyed it!